What the heck is a BEC? Our Battery Eliminator Circuit is a little device that eliminates the need for a receiver and servo battery pack. It draws higher voltage from the motor batteries and drops it to a voltage level that is suitable for your receiver and servos. This is required in applications which draw high power for multiple servos or use more than 3S motor packs, as most ESCs with linear BECs are not designed for these applications. CC BEC is better because it is smaller, cheaper, and far more powerful. 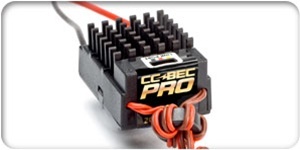 NOTE: CC BEC Pro should never be operated in series or parallel with another BEC or backup receiver pack connected to the RX/Servo side of the circuit.